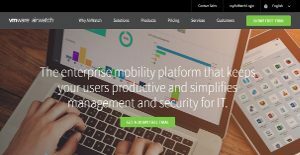 AirWatch is your answer if you want a scalable solution for enterprise mobility. The software is offered by VMware, a huge producer of premium quality mobile device management solutions. Vmware AirWatch claims to transform your business through consumer-centric solutions that allow employees to use their own devices without compromising the security of your data and systems. The trial version of AirWatch allows its users to enjoy the fully functional product trial for 30 days and enroll up to 100 devices. After that, you can choose any of the 4 suites available at very low prices. Due to the benefits AirWatch offers, it enjoys many credible names from around the globe as its customers, including United Bank, MERCK, US Army Corps of Engineers Target, The Home Depot, Columbia and Delta. AirWatch is an amazing solution for enterprise mobility. It can be scaled down to suit needs of any enterprise for their mobility strategies. Now employees can bring their own devices to the workplace because AirWatch can manage all the endpoints. Employees can manage data on their work and personal applications separately on the same device to protect privacy. It provides seamless access to all the applications with equal ease regardless of their geographical location. Not only this, it also creates synchronization in operations carried out through employees’ owned devices and company-owned devices. You can use AirWatch to automate processes. Through automation, you can align processes with policy engines in a better way. Automation means there will be less need for manual tasks and consequently least chances for human errors. You can use applications specifically tailored for mobiles devices for sending or receiving emails and for other purposes to get rid of the need to go back to the system every time such a need arises. AirWatch supports a seamless flow of data by configuring devices with email, intranet sites, apps, Wi-Fi, content, and VPN. It can be integrated with most backend systems and everything is kept secured through high-end security procedures and data loss prevention policies. All of it makes company data secure from internal as well as external threats. Every organization has different wants and requires an application that can be customized for their size, kind of employees and customers, and the particular industry they are in. For these reasons, no platform can offer perfect tools out-of-the-box. When you look for a software app, first be sure what you require it for. Read some AirWatch reviews and ask yourself do you desire basic features or do you want complex functionality? Are there any industry-specific features that you are seeking? Obtain the answers to these queries to aid your search. There are lots of factors that you need to consider and these include your budget, specific business wants, your organization size, integration requirements etc. Take your time, check out a few free trials, and finally choose the system that provides all that you want to enhance your firm competence and productivity. How Much Does AirWatch Cost? We realize that when you make a decision to buy IT Management Software it’s important not only to see how experts evaluate it in their reviews, but also to find out if the real people and companies that buy it are actually satisfied with the product. That’s why we’ve created our behavior-based Customer Satisfaction Algorithm™ that gathers customer reviews, comments and AirWatch reviews across a wide range of social media sites. The data is then presented in an easy to digest form showing how many people had positive and negative experience with AirWatch. With that information at hand you should be equipped to make an informed buying decision that you won’t regret. What are AirWatch pricing details? What integrations are available for AirWatch? If you need more information about AirWatch or you simply have a question let us know what you need and we’ll forward your request directly to the vendor.